It is that time of year again, where school starts, and lunches are being packed. Sandwiches are easily taken but switch it up with this healthier version of Pizza Pockets. Combine the whole wheat flour, dry yeast, sugar, salt. Add the warm water, and oil. Add enough of the all purpose flour a little at a time to knead into a smooth and soft dough. You may not need all the of flour, or you may need a bit more, depending on the humidity. Roll out the dough and cut into 6" circles. Fill with desired amount of filling. Moisten the edges of the dough and fold over to seal well. Prick the tops with a fork, brush with beaten egg. Bake @ 400 about 15-20 minutes or until golden brown and it sounds hollow when tapped. 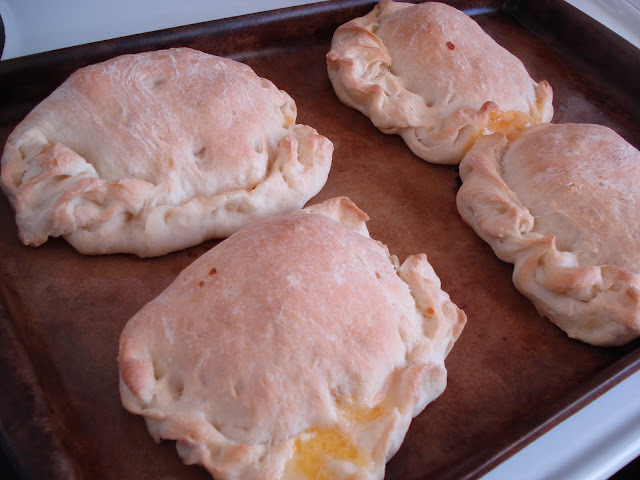 If you have any dough left over, just form them into buns, let rise 30 minutes and bake the same as the pizza pockets. Add the tomato sauce, herbs, seasonings. Add the green onions and the cheese. Put desired amount of filling into the prepared circles. The yield for the pockets is determined by how much you put in. Also the filling can be very versatile, switch things up a little to your liking. I don't believe I have a big enough skillet to brown an entire ground chicken, much less a whole ground turkey! LOL Is there a measurement missing? Today I blogged about Dorothy's pastry....I HAD to....it is AMAZING!!!! Do they taste good eaten COLD? Inquiring child minds want to know! Looks like a great recipe! Just a couple of questions---what thickness should I roll the dough and can these be frozen? I would love to make a batch to keep in the freezer for school lunches. I always try to make a variety of foods so the kids won't get tired of the same thing over and over... Thanks for all the wonderful recipes! yes, they do freeze very well. I roll the dough out to 1/4" perhaps a bit thicker, i have never measured. it depends on how big you make them as to how many pockets you get from one recipe. i made mine fairly large, because my kids are also grown and my son has a vivacious appetite, so not little morsels for him....and they taste good eaten cold or room temperature. our kids could never be bothered to use the microwave provided in the lunch room because of the long line ups, so always ate them at room temperature or cold. I made these today - my filling got really watery which made them hard to close (I used ground turkey). Am I doing something wrong? They still look pretty good even though most of them opened! I am just wondering is the 2 tablespoons of yeast right? elain, sorry that your opened and that the filling was runny. i am not sure why that would be. perhaps try a little less sauce next time, or let it simmer longer til it thickens up. i find that if i make the filling earlier and then let it cool it is a good consistency to work with. becky, i do you use 2 tablespoons instant yeast, but try one, it should work fine. i think i might try cutting it down next time i make it, now that i think about it. These look so good--can't wait to try them! I just helped my wife make these tonight for supper. Wow, are they ever awesome -- lightly crisp outer crust thanks to the egg wash, with soft, fluffy dough and very flavorful filling. Our kids devoured them!